We are sorry for any inconvenience caused to our customers due to the outage that occured last weekend. Unfortunately a record ice storm caused loss of power, cable and telephone over much of southern New Hampshire and eastern Massachusetts. 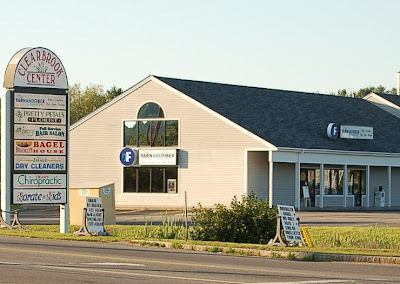 Many areas are still to have their services restored (including our home) although we are pleased that the store returned to service with 12 hours (thank you PSNH) and the web service was restored later on Saturday. Unfortunately we were unable to "post" that our service was down (we had no way to do so), and apologize for any confusion this may have caused. We hope that service to the rest of our community will be restored in short order as this is causing great hardship for many of our customers and friends. Normal Internet and shipping service is now fully restored. 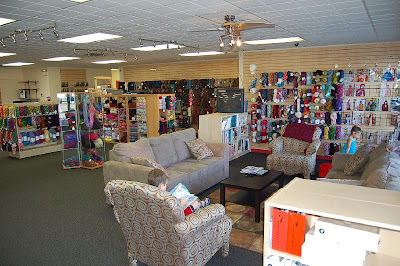 We finally tired of squeezing every possible skein of yarn into the old shop location and have moved to a new larger shop in Derry New Hampshire. The new store is much more spacious and more comfortable to shop in. 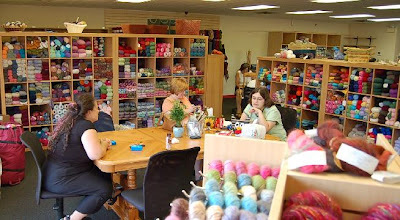 We have tried to make it easier to locate yarns and have provided a comfortable area with couches for sit knit and chat. The classroom area is much larger, quieter and very comfortable. We now have a much larger warehouse and shipping area and comfortable offices to keep you in touch with what is happening. We hope you enjoy shopping with us more this comming year than even before.